After making waves by denouncing the use of gender-neutral pronouns on campus, Jordan Peterson has now gone after the modern Disney classic about sisterly love. Cultural critic, clinical psychologist, and University of Toronto psych professor Jordan Peterson is known for his controversial views. The author of a new book, 12 Rules for Life: An Antidote to Chaos, Peterson set off a firestorm in 2016 with his blatant blowback about the increasing demand for the use of gender-neutral pronouns on campus. Now the button-pusher has taken on a modern classic — the beloved animated Disney film Frozen, calling it “deeply propagandistic” in his new book. In an interview with Time, he explained his chilly reception to Frozen (in which sisterly love between Queen Elsa and Princess Anna essentially saves the day), the reasons for which appear couched in the fairy tale’s refusal to place a heterosexual relationship at the core of its narrative. Peterson, who wrote about fairy tales, myth, and religion in his book Maps of Meaning: The Architecture of Belief, is certainly well-versed in the subject of archetypes and fairy tales, but his refusal to acknowledge the changing world around him on a university campus where he refused to respect his students by using their preferred pronouns is indicative of a refusal to accept that fairy tales and myths may shift with the culture. When Time interviewer Belinda Luscomb pressed him to justify his stance and asked if Frozen were more “propagandistic” than The Little Mermaid, he was implacable. “Those other movies are based on folktales that are maybe — some of those folktales have been traced back 13,000 years,” Peterson said. After pressing him a few different ways, Luscombe got to the crux of Peterson’s problem with Frozen when he explained that for him, Harry Potter works because Harry has both light and dark in him. But when Luscombe pointed out that Elsa, who has the power to freeze the world around her out of fear, has both light and dark in her, Peterson sidestepped the question as if she hadn’t asked it. Rather, he called the plot twist in which the kind, handsome prince who courts Anna in the beginning of the film becomes a villain the most “propagandistic” part of the movie because there was no indication that he might be evil, as if bad people don’t hide under a veil of good and gaslight people all the time in real life. 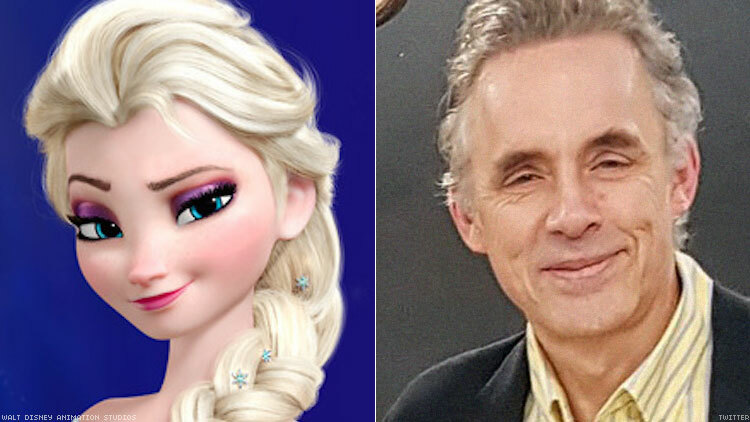 “I doubt very much whether people will be watching Frozen in 10 years,” Peterson said, as if the implications of myths don’t change over time.